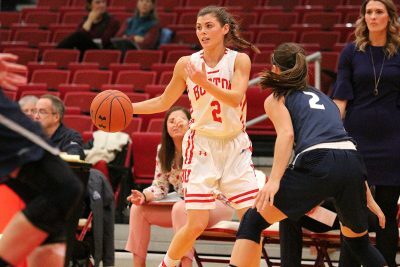 Facing an 11 point deficit at halftime, Boston University women’s basketball snuck out of enemy territory with a 47-44 win at Lafayette College Wednesday night. The first five minutes of the first quarter began with BU jumping out to a 6-4 lead, with junior forward Nia Irving hitting a layup and a jumper and sophomore guard Katie Nelson hitting her own jumper. This would be the last time BU held a lead against the Leopards in this half of the game. Lafayette quickly distanced themselves from BU within the first quarter, which began with three pointers by Leopard guard/forward Olivia Martino and guard Nicole Johnson. BU would come within striking distance again in the second quarter, but Lafayette would set an 11 point barrier between them and the Terriers at halftime. This was a result of Lafayette going on a five-point run and seven point runs all during a period when the Terriers only scored four points. The points that broke those runs totaled 6:01 of play time. During halftime, Moseley said she assured the team that the game was not over. Despite the distance between the teams, BU stopped Lafayette from running away in the third period, outscoring the Leopards 12-6. Although BU did not grab the lead, they reduced their 11 point deficit to five going into the fourth quarter. The fourth quarter was the chance for the Leopards to stop BU from creeping in further, in front of their Easton, Pennsylvania, crowd. The Leopards were unsuccessful — it took three minutes for BU to equalize the game at 39 apiece. Before Lafayette was able to score in the period, two free throws from freshman forward Riley Childs, one from Irving and a jumper from Childs brought BU back into the game. BU kept Lafayette scoreless for seven minutes and 11 seconds in this quarter. They took a 41-39 lead before Lafayette equalized again. The game remained close, as BU held a 47-44 lead with 1:16 remaining. With six seconds remaining and the score remaining the same, Lafayette called a timeout with the ball about to be in their possession. Leopard guard Drew Freeland missed the game-typing three-point shot with one second remaining, giving the Terriers a very close Patriot League win. The Terriers resume action with another Patriot League game Saturday at Case Gym. They will face Bucknell University, who are currently tied for first with American University in the Patriot League standings. This road win, combined with the road win last weekend against the United States Naval Academy, should give the Terriers the confidence they need to face Bucknell at home, Moseley said.